Ian Haight is the co-translator of Borderland Roads: Selected Poems of Ho Kyun, and editor of First Mountain Snow: Zen Questions and Answers from Korea, both from White Pine Press. He has been awarded translation grants from the Daesan Foundation, Korea Literary Translation Institute, and Baroboin Buddhist Foundation. Poems, essays, and translations appear in Barrow Street, Writer’s Chronicle, and New Orleans Review. For more information, please visit www.ianhaight.com. In the poems you have selected, Ho Kyun (a 15th-century nobleman) comes across as a bit of a risk-taker, and perhaps not entirely wise; his reflections seldom seem to go as deep as the Chinese poets he emulates and are not as emotionally engaging as (his sister) Nansohron’s poems. Yet his descriptions of life in wartime are clear, and his confusion and regrets are well-relayed and understandable. The reader feels compassion for Kyun. Can you tell us what makes him a man of his era—the context of the times—and also a person who was not keeping step with his milieu as expected, a man somewhat outside the box? Kyun was a man of his times in the obvious ways: he was a Confucian scholar; the opportunities he was given came from his family’s position and reputation, while those he created for himself came from his intellect. Kyun was probably among the very best minds of his time in his areas of expertise. The ways he was out of step with his times make him an interesting figure in Korean literature and Korean history. Kyun was not afraid to complain about issues he felt were being handled unjustly, especially women’s rights, Korea’s social pecking order—which at the time was based on noble blood lines—and the deplorable lives of lower class people in Korea. Yet he had no problem consorting with courtesans and had a “little black book” on all the ones he met or heard about. Do we judge him on the ethics of our time or on the ethics of his? And what if the ethics of Kyun’s time damned him for going overboard with women? This kind of complexity is part of what drew me to him as both a literary and historic persona. Can you talk a little about how Korea inherited Chinese literary traditions, and how Korean writers reinterpreted those traditions? I know that you have suggested that the Chinese classicists in America seem to think classical Korean literature is not much more than a knock-off of the Chinese and therefore not as original or interesting. What makes Korean poetry different from Chinese? Where are the departures? I would say the influence on literary traditions between China and Korea has often been reciprocal. Considering the 5,000+ year history of both countries, generally I would agree that China has had more literary influence on Korea than the other way around. The simple fact that most of Korea’s classical literature was written in classical Chinese appears to bear this out. However, at least one writer in Korea’s literary tradition (Nansorhon Ho, Kyun’s sister) has been held in the highest esteem by China’s literary community, counted as an equal with China’s most respected writers—writers like Li Po or Tu Fu. These sentiments were held for hundreds of years, and depending on the scholar one talks to in China or Japan, are still held. The problem many scholars have with the classical literary tradition in Korea is that it appears to be merely imitative of classical literature in China. I’ve always thought this somewhat of an odd comment because the starting point of most every classical Chinese poem—as a tradition in China—is imitation. The greatness of a poem was determined by values that changed through China’s history, but the themes were inherited. So to say that classical Korean literature is just an imitation of classical Chinese literature seems a bit disingenuous; classical Chinese poems traditionally start with inherited premises. Korean writers were able to achieve a level of formal and thematic unity the most celebrated Chinese writers never did. That might seem an opinion, but if one looks at the formal achievements comparatively, it appears to be objectively true. Thematically, classical Korean literature is an interesting blend of both cultures. What makes classical Korean literature distinctive is how it integrated and adopted the Chinese tradition into Korean culture—at least in my opinion. What about linguistic differences? The written poem versus the sound of the poetry? Isn’t Korean written with an alphabet? Does only the literature use the Chinese characters? How does that affect the poetry? It seems as though it must. Yes, the Korean alphabet is phonetic. Kyun took the bold step of writing the first novel in Korean, not classical Chinese. He wanted literature to be accessible to common people, not only those who had received a classical education and could read Chinese. The novel happened to be a “Robin Hood” type adventure where the main characters go off and live on an island. Tellingly, the island is still part of the Korean nation but has its own laws which are fairer to all people and both genders. With respect to the poetry, yes—the written versus spoken classical Chinese is an issue. There is a Korean pronunciation of Chinese characters, and, obviously, a Chinese pronunciation of the characters. It is interesting to read some of the poems under these terms. I don’t believe Kyun was as attentive to these matters as his sister was. In his sister Nansorhon’s poems, we find words which, according to a reading in the Korean language, might be a simple tale of a man and woman meeting. However, in a reading according to the Chinese, it comes off as a bit sexually explicit. This was undoubtedly intentional given the issues she was dealing with and writing about. Kyun has his moments where he performs as a formal master of classical poetry, but he was not as interested in this kind of wit—at least as I understand his poems. Kyun, at base, wanted art to be accessible and understandable for everyone, and not elitist. What about the beginning of the book? Your introduction is unusual. It is a speculative biography. What made you decide to write a prose “story” of Ho Kyun’s life—in second person, no less—instead of going with a more formal biographical introduction for this collection? I got the idea to write an “interpretive introduction” from one of my peer editors. Originally it was a pretty dry introduction—the sort of standard fare you might find in a history book. She suggested that format and I thought it was a novel(-istic) approach and worth doing, mainly because of what it said about the translation process: if I knew the writer well enough to translate, shouldn’t I be able to muster something in a kind of prose “story” that approximated his life? Second person just came out. It felt right. In hindsight maybe this was because I didn’t want to appear to completely own the point of view through a first person voice. You have told me you are not fluent in Korean, although you have certainly been speaking the language for a long time. How long did you live in Korea? How did you make the connection with Taeyoung, your collaborator in this translation project? What made you decide you needed a translation partner—or was it Taeyoung who approached you about Ho Kyun’s poetry? I lived in Korea for about seventeen years. When I decided to write poetry seriously, I realized most of the writers I respected had done translation work. I thought I should take advantage of where I was living and try to do some translation work to become a better writer. When I set about translating Korean poetry, I soon learned that it would be helpful to have a partner. There was a poem I was working on by Kim, So-wol, and I mistranslated a word as a season when in fact it was a conjugated verb; the word uses the same characters identically. The poem made perfect sense both ways, but only someone really fluent in the culture would catch which way was correct. There were other reasons to seek out a partner, but that incident was a big one. I met Taeyoung through my wife; he was a friend of our family. I knew he was a retired mathematics professor, and he knew I was an English professor. I didn’t realize the extent of his education and interests, and I still hadn’t found a body of writing that felt like a solid workable project. When he showed me a poem by Nansorhon in Korean and mentioned it hadn’t been translated into English yet, I knew I found a project I could commit to. As fate would have it, it took grant funding for several other projects before I could get funding for the one I always wanted, which was Nansorhon. 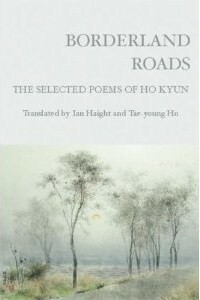 What makes Kyun (or Nansorhon or any other Korean poet) worthwhile to translate in terms of literary tradition? What do you think of as your main purpose in helping to disseminate these works to an English-speaking, western audience of readers and scholars? My main purpose when I started out was to learn so I could become a better writer. Luckily I fell in love with the poems I chose to translate and the life stories of the authors. That became a self-motivating principle. People still know very little about Korea, its culture, and its history. Usually when people think of Asia or East Asia they think of China or Japan, but there’s something special about Korea that’s worth exploring. Both during and after his life, Kyun’s writing was ordered destroyed by Korea’s ruling elite. What does it say about his importance as a poet that people protected/hid his work so that later generations could read it? Was it accident, or do you think those who kept his poems from state destruction did so knowingly because there was artistic merit in the poems? What does the rescue, the salvage of Ho Kyun’s literary output mean for Korean literary heritage today? –I realize you speak about this as something of an outsider yourself. I’m not sure exactly who saved his writing or how. I imagine some of it was saved by the literary social outcasts he spent time with. I’d like to think the King secretly saved at least some of Kyun’s writings, despite his order that everything should be burned. There is evidence the King respected Kyun even as he ordered Kyun’s execution, and in fact didn’t really want to have Kyun executed. Time will tell how history evaluates Kyun as a literary figure. His criticism remains studied in Korean literature courses taught in Korea. The first novel in Korean he wrote, Hong, Kil-tong, is a cultural artifact in Korea. An extended TV drama inspired by the novel was broadcast during evening prime time in Korea last year. Kyun’s poetry has not been given as much attention, but as a literary record of the war and times he lived in, the poems feel relevant. They provide context for Kyun’s other literary works, his life, and the life and writing of his family—a group of people who, when taken as a whole, are among Korea’s greatest classical writers. In closing, explain the main challenges of the translation process as you experience it. What did you learn that is most applicable to other translation projects? What did you learn that is applicable to writing and revising your own, original work? Over the years, the challenges posed by translating have changed. At first they were about understanding how the Chinese language was working in the poetic lines and how a poem could be derived from what otherwise appeared to be a mess! Now the challenge is how to make a poem with well-worn images interesting, but at the same time faithful to the original. Getting all the story references for endnotes can be a real chore, but unfortunately is necessary for a reader to really get what is happening in a poem. I hope by including the story references readers can understand the cultural freight the poems are carrying. For my own writing I’ve learned dedication. Syntax, precision of language, meaning, and imagery is easier for me now. I’ve learned patience. Spending hours and days on a line in translation is not tedious anymore, because when the line is right, the rewards for the labor are so great: loving the poem that comes from the translation, and feeling a connection to the human and his or her life that created the original. Hopefully I can bring some of that love into writing my own poetry. Interview by Ann E. Michael. Poets’ Quarterly | Winter 2011.